The head up display, or “HUD”, in fighter aircraft allows the pilot to keep his attention predominantly focused outside the aircraft where the bad guys are most likely to be found. The HUD displays aircraft performance data, targeting information and weapon system status as an image overlaying the forward through-the-windscreen view. The HUD operates in many different modes and will display data most useful to the task at hand. For example, during take offs and landings, the unit displays data like pitch, heading, airspeed, and altitude. During combat, aircraft performance data is pared down to the most essential to minimize competition with the display of threat and weapon systems information. Most HUD imagery consists of vector drawn symbols, but some HUD systems can also display raster drawn images from FLIR sensors. The HUD places its imagery at optical infinity, much like a high quality telescopic gun sight, which, in essence, is what a HUD is. By doing so, the HUD image stays aligned with the outside world regardless of how the pilot might move his head. So, in combat mode the cross hairs always indicate where the weapon systems aim, and in navigation mode the virtual horizon line always aligns with the real horizon. The basic structure of a fighter HUD is straightforward. The imagery is most frequently generated by a high brightness CRT. HUDs must operate day or night, and sun light bouncing off cloud tops is really, really bright. A series of lenses generate a virtual image of the CRT faceplate located far in front of the aircraft, so the HUD is in fact a type of collimated display. 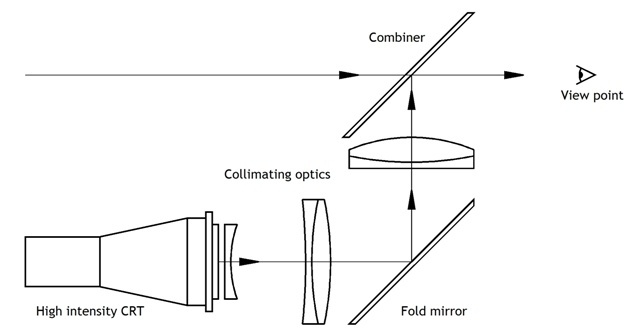 A fold mirror in the midst of the lenses allows the optical chain to fit into a (relatively) small package. Finally, there is the combiner, a partially reflective mirror which allows light from outside the aircraft to pass straight through while reflecting light from the CRT into alignment with the outside light. The pilot sees the through-the-windscreen view with the HUD imagery added to it. A HUD in a fighter plane is an in-your-face chunk of technology. For many such aircraft, the HUD is active 100% of the time. Building a simulator of this type of fighter begs having a functioning HUD. It’s not as impossible as many think. I’m going to sidestep the details of creating the HUD imagery since they depend on the specific simulator application you’re running. Instead, I’ll cover the optics where most of the magic resides. A HUD for a simulator is much like a real HUD, but we get to make some simplifications. First, the simulator HUD won’t be operating against sun lit clouds at 50,000 feet. We won’t need a ridiculously expensive high intensity CRT. A small LCD panel will do just fine. Second, the simulator HUD doesn’t create a virtual image at optical infinity. What it must do is create a virtual image at the same distance as your external scenery display device. If the HUD virtual image is coincident with the scenery image, there won’t be any relative movement between the two images when the viewpoint shifts. Finally, perfect image geometry need not be a requirement. By accepting some distortion, a simulator HUD can be built using a single lens. 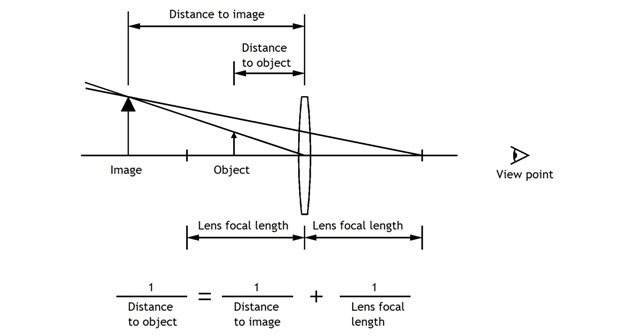 If you look at an object through a convex lens and the object is closer to the lens than the lens focal length, you’ll see an enlarged image of the object which appears to be farther away than the object is. As the object is moved away from the lens, but remains closer than the lens focal length, the image gets larger and farther away. We’ll use this property in a HUD for a simulator. You can use the lens maker’s formula to determine the spacing between the lens and the LCD screen for a simulator HUD. 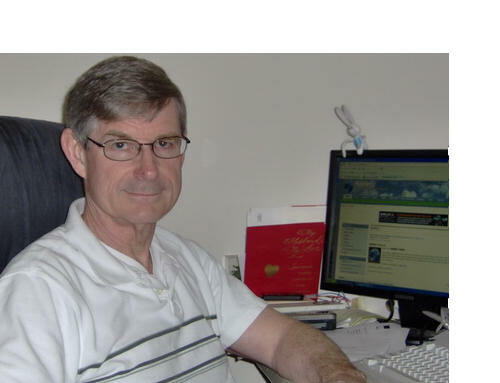 For example, suppose we have a lens with a focal length of 11.5” and we want to locate the HUD imagery 60” away to be coincident with the screen displaying external scenery. Plugging the numbers in the formula tells us there should be 9.65” between the lens and the HUD imagery display. The simulator HUD requires a combiner the same as a real HUD. A teleprompter mirror works well. Since the simulator HUD is added to boost the overall sense of immersion in the simulator, you’ll probably want the unit exterior to look the same. Likely this means you’ll need a fold mirror as well. A standard glass mirror will work, but you’ll get a somewhat better reflection using a front surface mirror. A front surface mirror will not produce ghost images as a standard (rear surface) mirror will. So, what’s the advantage of the more complex optics in a real HUD? Well, more optical surfaces means the designers have much more control over all aspects of the image. They can correct geometrical distortion over the full field of view, and they can control the image size. Using a single lens means having to accept some distortion, particularly around the edges, and having to control the size of the image by altering the image on the display unit. You can use a more complex lens configuration to reduce distortion. The problem is cost. To get a reasonable field of view, the lens must be large, typically about 5” in diameter. New, this is about $50 from a company like Edmund Optical. 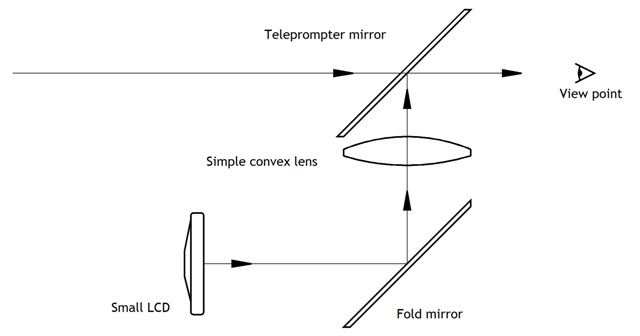 A step up from a single lens is a pair of lenses called a doublet which is designed to reduce geometrical distortion. They are stock items in smaller diameters, but are apparently special order items for the diameter needed for a HUD.